The Gospel of Jesus’ Wife: Was Jesus Married? I thought the issue of whether or not Jesus was married was settled when Dan Brown’s fiction book, The Da Vince Code, often taken as non-fiction, was debunked by one conservative biblical scholar after another. Yet the conjecture Jesus had a wife does not seem to ever want to go away. In The Da Vince Code the author relied heavy on third and fourth century Gnostic texts to concoct his unprovable premise that Jesus and Mary Magdalene were married, and together brought a child into the world, Jesus Jr. According to Brown and Michael Baigent’s Holy Blood, Holy Grail (the true literary source for Brown’s plagiarised work), Mary Magdalene took the “Jesus child” out of Israel to protect her treasured progeny and made off to France. The child grew up, married and fathered a child whose descendants married into the French royal line and, after several generations, engendering the Merovingian dynasty. Dan Brown’s hypothesis bears no biblical evidence and lacks historical proof as many biblical researchers exposed during the “Da Vince Code” mania that grabbed the attention of the biblically illiterate who would rather believe a Hollywood film over the historical veracity of the Bible. Yet somehow Tom Hanks, who starred in the film production is more credible than Matthew, Mark, Luke and John! Recently Harvard Divinity School historian of early Christianity Karen L. King announced she has come across an ancient papyrus fragment from the fourth century that, when translated, appears to indicate that Jesus was married. The text is being dubbed “The Gospel of Jesus’ Wife.” The part of it that’s drawing attention says, “Jesus said to them, ‘my wife'” in the Coptic language. The text, which is printed on papyrus the size of a business card, has not been scientifically tested to verify its dating, but King and other scholars have said they are confident it is a genuine artifact. In her presentation about the Coptic fragment King admits the papyrus does not prove Jesus was married. What it does prove, according to King, is that the debate about Jesus’ marital status was present in the early formation of Christianity. In fact, in order to give credence for those who advocated celibacy as the highest state of purity, many Christians appealed to Jesus’ unmarried status. The fragment only has eight incomplete lines of text on one side and additional barely legible lines on the other side showing only three faded words. The text is written in the Coptic language rather than Koine Greek, so it is a copy of an earlier version or an original penned in the fourth century. King claims it is from a second century Greek text but offers no proof. Along with Karen King, Princeton University professor Anne Marie Luijendijk and Roger Bagnall, director of the Institute for the Study of the Ancient World, claim they have confirmed the document is valid. So what should Christians make of this most recent discovery of a papyrus fragment from the fourth century that claims Jesus was married? Was Jesus married? If so, and this fact was deliberately or inadvertently left out of the New Testament records of the life of Jesus, does this then cast doubt on the accuracy of the four gospels and their writers? First, the document is from the fourth century. Four hundred years after Christ lived on earth. How can writers in four hundred years later know more than the eyewitnesses who lived with Jesus three years and knew His life on a daily basis? Second, the dating is not verified yet, but give or take a fifty or one hundred years we are dealing with a document 300-400 years removed from Jesus’ historical appearance on earth. I find the historical method used by King to be highly unusual. When asked where did the papyrus come from. King answered, “We don’t know. . . nothing is known about the circumstances of its discovery,” an admission that has raised red flags for other scholars. King speculates the fragment may have been tossed in an ancient garbage heap by someone who objected to the idea of Jesus being married. As a student of biblical history, I am somewhat taken back by King’s unfounded speculation about an historical document about which he is clueless regarding its origins. Instead, this Harvard scholar offers her conjectured opinion based on absolutely nothing. 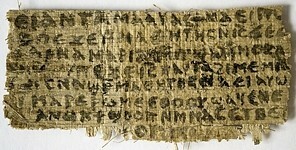 Third, the Coptic papyrus fragment does not prove Jesus was married. Even King admits the historical artifact is not old enough to prove Jesus was married. The only thing the document proves is that early Christians may have discussed whether Jesus was married. King also acknowledged that Jesus might have been speaking figuratively when he referred to “my wife.” After all, the fragment is just 33 words long, with incomplete sentences and very little context. Fourth, in the fourth century Gnosticism was at its peak in influencing unsuspecting Christians. This is when all those weird gospels made their appearance such as the Gospel of Judas made their contested appearance in Christianity. Gnosticism was always looking for “secret knowledge” and seeks to reveal hidden truth about Jesus previously unknown, hence the entire gnostic influenced premise of the Da Vince Code which has been disproved over and over. The Bible, of course, says nothing about Jesus marrying, though New Testament writers occasionally used the metaphor of the church and God’s people as the “bride of Christ.” Some of the Gnostic gospels — ancient texts unearthed in the 20th century that are not included in the Christian canon — suggest that Jesus had an intimate relationship with Mary Magdalene. The apocryphal Gospel of Philip, for example, says that Jesus kissed Mary, and loved her more than the apostles. Again, these are unfounded speculations based on documents that came later than the original gospels written by men who knew Jesus. Fifth, Gnosticism made its appearance in the first century in an elementary form and was refuted by the New Testament writers. They claimed Jesus was pure spirit and did not have a human body. To the Gnostic flesh is evil. I John deal with the fact that to be a believer one must confess Jesus came in the flesh in order to be a true believer. Dear friends, do not believe every spirit, but test the spirits to see whether they are from God, because many false prophets have gone out into the world. This is how you can recognize the Spirit of God: Every spirit that acknowledges that Jesus Christ has come in the flesh is from God, but every spirit that does not acknowledge Jesus is not from God. Sixth, this is a fragment the size of a business card. Are you going to trust the four books of four eyewitnesses who lived with Jesus or a fragment from a papyrus? Seventh, Harvard professor Karen King is a specialist in Gnosticism, “King, who focuses on Coptic literature, Gnosticism and women in the Bible, has published on the Gospel of Judas and the Gospel of Mary of Magdala.” Is it any wonder that these extra-canonical books which contradict the New Testament make their appearance in order to cast doubt on the validity of the New Testament canon. A lot of the teachings in these text contradict the theology and teachings of Jesus and the writers of the gospels and the epistles. Eighth, if Jesus was married, then when He was on the cross, why did he tell John to only take care of His mother and not His “wife”? Also, the NT lists Jesus’ brothers and sisters, mother and father, his cousin John the Baptizer, and his aunt and uncle Elizabeth and Zacharias. Why wouldn’t his wife be mentioned? Ninth, the issue raised by the appearance of this Coptic text, despite what King claims, is not celibacy as viewed by early Christians or whether or not Jesus remained chaste. The significance of this “discovery” is whether a Gnostic papyrus fragment the size of a business card written 400 years after Jesus has more authority than the four books of the New Testament by men who knew Him intimately. For further information on this “wife of Jesus” Gospel, check out BIOLA professor Gary Manning Jr.’s blog.